A new library display about Who? MSOE's Walter Schroeder Library has become an even more interesting location for students to visit on campus. A number of friendly changes have taken place including the addition of a paperback reading area, complete with comfy couches and a selection of donated best sellers and popular fiction. Students have also noticed that there is a new feature to the library, an exhibit area that contains revolving displays on a variety of topics. Students, from August to November, may have seen the "Get Out and Vote!" exhibit that featured autographs and photographs of American presidents, campaign buttons, books, and even newspapers from the day of Kennedy's assassination. This historical display, presented by Rick Gagliano, featured all the wonderful politically related items that he has collected and people rarely get to see. Now a new display has gone up in the library and this one is about Who. No, that wasn't a question. The current display is about "Doctor Who," the longest running science fiction television program in the world. Doctor Who was an English science fiction show that started its run in 1963 and ran for 26 years. As popular culture author John Kenneth Muir wrote, "To put that in a historical perspective it ran from Kennedy's assassination until the end of the cold war when the Berlin Wall came down." That's one heck of a run. Even the longest running Star Trek spin-offs lasted only seven years a piece. The current display in the library is called "Time and Space on Television." The exhibit focuses on popular culture and the show Doctor Who. The current display features Doctor Who autographs, books, magazines, comic books, photos, and toys. These are all interesting as these are some of the earliest mass marketed science fiction items. Most interesting to the display is that it features two actual costumes that were worn on-screen. Also of note, there is the actual model of the Doctor's TARDIS time machine on display that made an appearance in the film, Star Wars: Episode I—The Phantom Menace. The display also has articles about popular culture and Doctor Who's web page written by some notable Doctor Who researchers, and it even has a video introduction by one of the actors who worked on the show. The exhibit and its web site are expected to draw science fiction fans and visitors from all over until the exhibit ends in March. On a similar note, due to the amount of interest in engineering that popular culture has generated, in 1993 MSOE presented an honorary Doctorate Degree to James Doohan (who portrayed Scotty in the original Star Trek series). The Doctor Who display is a continued celebration of the exposure that popular culture and science fiction has given to engineering. The Doctor Who show has been popular with MSOE students since the 1980's when a student group, called "The Time Engineers," (advised by Dr. Bob Strangeway) were an active campus club. Now the Time Engineers are part of MAGE, and MAGE members still gather weekly to discuss one of their favorite programs. MACE, as well as, the Earthbound TimeLords and The Wolves of Fenric (UK) sci-fi clubs are co-sponsors of this exhibit. 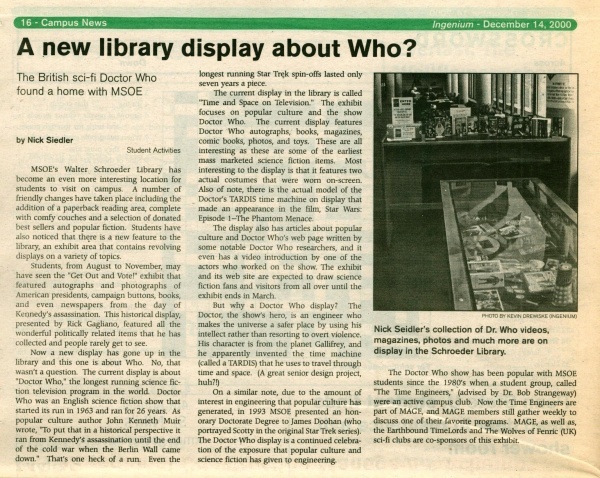 Caption: Nick Seidler's collection of Dr. Who videos, magazines, photos and much more are on display in the Schroeder Library. APA 6th ed. : Seidler, Nick (2000-12-14). A new library display about Who?. Ingenium p. 16. MLA 7th ed. : Seidler, Nick. "A new library display about Who?." Ingenium [add city] 2000-12-14, 16. Print. Turabian: Seidler, Nick. "A new library display about Who?." Ingenium, 2000-12-14, section, 16 edition. This page was last modified on 2 July 2014, at 23:04.